With the Keystone XL pipeline at least temporarily blocked, the next target for those hoping to limit the climatic damage done by Canada’s oil sands should probably be the Northern Gateway pipeline. This pipeline is intended to run from Alberta to Kitimat, in British Columbia, and allow the export of synthetic crude from the oil sands to Asia. Many people have argued that blocking Keystone XL would have no tangible effect, because all the oil that would have flowed through it to the US would just end up going to Asia instead. This analysis is dubious on its face – it is surely an expensive proposition to ship oil sands products across the Pacific, and cutting off any market is likely to reduce the total level of oil sands exploitation. The argument becomes even more untenable if pipelines for export to Asia can be blocked as well. A big part of the effort to block the Northern Gateway pipeline is being made by First Nations communities with territory that would be crossed by the pipe. Aboriginal groups in British Columbia said on Thursday they have formed a united front to oppose all exports of crude oil (CL-FT101.200.240.24%) from the Alberta tar sands through their territories. The declaration is another political blow to the Canadian energy sector and Canada’s right-of-centre Conservative government after Washington decided last month to delay approving a pipeline carrying oil sands crude to the Gulf Coast. After the delay of the Canada-U.S. Keystone XL pipeline, opponents of the Northern Gateway project running from Alberta to British Columbia are preparing for a tougher battle, even as Enbridge Inc. maintains it has no plans to change tactics. With Ottawa becoming more anxious to ship Alberta’s oil to Asia, it will intensify the fight for anti-Gateway activists, even though they view the Keystone decision by the United States as a victory. VANCOUVER — Two chiefs of the Gitxsan First Nation in northern B.C. said they are “in shock and embarrassed” after Enbridge announced Friday that the aboriginal community had become an equity partner in its embattled Northern Gateway pipeline proposal. Norman Stephens and Marjorie McRae said they have the support of most of the other 63 chiefs and the rest of the First Nation in denouncing Friday’s agreement announced by Enbridge and Hereditary Chief Elmer Derrick. Friday’s deal was projected to bring at least $7 million to the community. “The majority of the hereditary chiefs didn’t know that this nonsense was coming — we didn’t even know he was negotiating with them,” said Stephens, also a hereditary chief who goes by the traditional name Guuhadawk. “The hereditary chiefs did not know about it and are opposed to it. Media attention on Northern Gateway reached a new crescendo over the past several days when Enbridge announced Friday afternoon that it had reached a deal with the Gitxsan First Nation to support the pipeline in exchange for an equity share in the project. But within 48 hours of the announcement, it became apparent that there was significant opposition with the Gitxsan community about the deal. By Monday afternoon the uproar within the community resulted in a significant backlash against the decision within the community and a group of Gitxsan Hereditary Chiefs are renouncing the deal and demanding the resignation of the individual who participated in the announcement. CALGARY — The joint review panel hearing submissions on the controversial Northern Gateway oil pipeline to the B.C. coast will take a year longer than expected to deliver its final report. That’s a year later than expected, confirmed Annie Roy, panel spokeswoman. Enbridge chose Kitimat as its port. 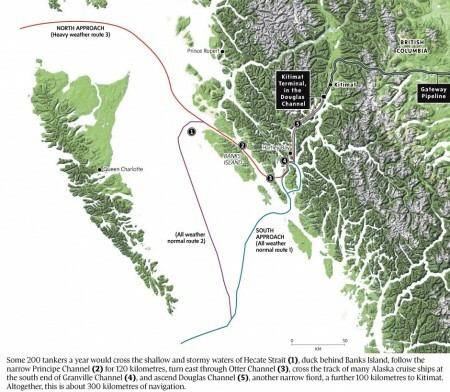 This means some 200 tankers a year would cross the shallow and stormy waters of Hecate Sound, duck behind Banks Island, follow the narrow Principe Channel for 120 km, turn east through Otter Channel, cross the track of many Alaska cruise ships at the south end of Granville Channel, and ascend Douglas Channel, another narrow fiord, a further 100 km to Kitimat. Altogether, this is about 300 km of tricky navigation in waters distinguished by fog, storms, and quite amazing tidal currents. 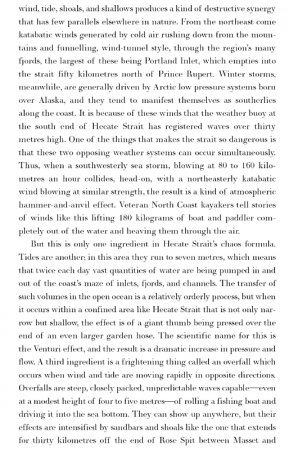 Whole volumes have been written about shipwrecks on the B.C. coast, end even with todayís modern navigation systems, ships run aground and sink. Something for the hearings to consider is what minimum investments would be required by the federal government — a strong proponent of the pipeline — to reduce navigational risks to an acceptable minimum. At the least these would include a whole new regulatory scheme, as we have never seen a project of this sort before. Ships and their crews would have to be certified to high standards, which have not yet been set for this environment. The pilotage system would have to be expanded, with new stations at Kitimat and perhaps Banks Island, and stout new boats to service the tankers. (The new pilot boat at Victoria cost $4.5-million, which at least made local yachtsmen fell they werenít the most extravagant folks afloat.) There would have to be new Coast Guard ships to supervise the transits, and to respond to emergencies. 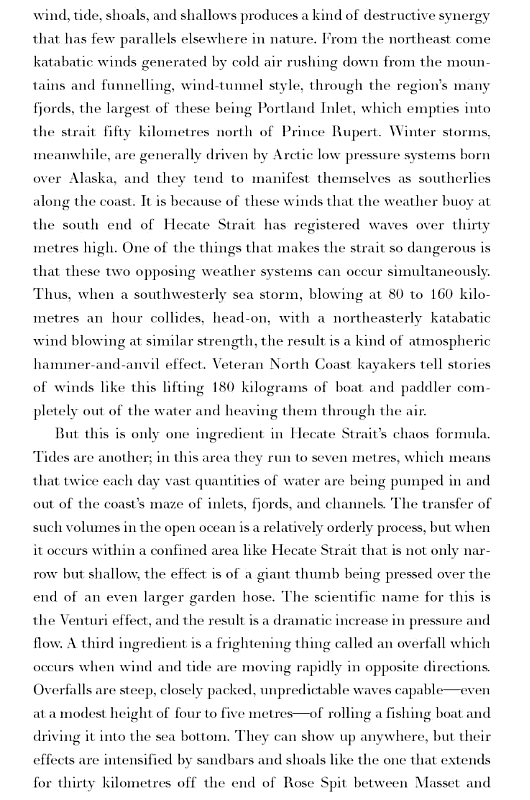 Novel technologies for containing spills and cleaning up in the aftermath would have to be devised and built for the proposed scale of operations in these cold northern waters. New Coast Guard doctrine would need to be prepared, and hundreds of new sailors hired and trained. At least there is time — five to seven years — to do this before pipeline operations begin, but only if the feds start now. The cost? Who knows, but $500-million would be a good starting point. No preparations for all this are yet visible. If provision is not made in Februaryís budget, the sincerity of Ottawaís support for Albertaís pipeline should be questioned. There is an alternative to the perilous journey to Kitimat, and that is the established industrial port at Prince Rupert. The pipeline would be about 200 km longer, but the sea journey would be comparably shorter. The western end of the route would travel down the Skeena valley, where existing road and rail facilities would lower the costs of construction. Since Enbridge swears its pipeline will be safe, there would presumably be little threat to the huge Skeena salmon run. Most importantly, Prince Rupert gives fairly directly onto Dixon Entrance and the great world ocean, which would considerably lessen the probability of a tanker disaster. New investment by the Coast Guard and the Pilotage Authority would be a lot less, though not zero. As you follow the unfolding controversy, ask yourself why Enbridge chose the less safe route, and whether we as taxpayers have to pay the premium for the risks the company has created. Ellis Ross, the elected chief of the Haisla Nation, hasn’t come lightly to his view of Enbridge Inc.’s proposed Northern Gateway pipeline. The thoughtful leader of the 700-member community on the shore of Douglas Channel has immersed himself in the study of energy markets, risk of spills, and how the energy sector tends to behave when accidents occur. He has also personally been involved in spill response, in jobs in government and in the private sector. The pipeline will not be allowed under any condition by the Haisla, the aboriginal group E most R affected by the $5.5-billion project. It’s not about anti-fossil fuels ideology, environmentalism or dirty oil, said Mr. Ross, who is no green ally and would look at home in any corporate boardroom. It’s because of the oil industry’s past practices and its long history of passing the buck rather than taking responsibility when something goes wrong, the Haisla’s chief councillor said. “They can’t guarantee they are not going to spill oil and they are not going to guarantee they can pick it up,” Mr. Ross, 47, said in an interview. Enbridge’s Northern Gateway project would send oilsands crude to Kitimat, B.C. OTTAWA — Prime Minister Stephen Harper’s government was blasted Tuesday with allegations it is intimidating witnesses and interfering with the National Energy Board’s hearings into Enbridge Inc.’s Northern Gateway pipeline proposal. Liberal interim leader Bob Rae said recent comments by Harper and Natural Resources Minister Joe Oliver show disrespect for the NEB’s independence, and violate the rule of law. Canadian pipeline builder Enbridge reported a leak from one of its pipelines on the day public hearings began into the company’s planned Northern Gateway pipeline. U.S. pipeline regulators told Enbridge about the possible leak. A subsequent helicopter over-flight discovered a metre-wide patch of bubbles over the company’s Stingray pipeline, which can carry 560-million cubic feet a day of natural gas from offshore wells in the Gulf of Mexico. The bubbles were found about 100 kilometres from the Louisiana coast. The Canadian government’s public-relations strategy, when it comes to the oilsands, is ham-handed. The message track goes like this: Canada and its oil are not enemies to the environment, but they are enemies to environmentalism. A lot of Canadians fall into that category. So do a lot of the lawmakers in other countries who are setting the policies that affect the market for Canada’s oil. You might think Canada would try its best to win those people over, to work with them instead of against them. HAZELTON, B.C. — Gilbert Johnson proudly pounds his fist against the piece of plywood he nailed over the doors of the Gitxsan Treaty Society Office last month. Johnson is among the Gitxsan aboriginals huddled beside an open fire in protest of the decision by one of their hereditary chiefs to sign a deal with Enbridge Inc., (TSX:ENB) in support of the Northern Gateway pipeline proposal. Hearings into the $5.5 billion pipeline began this week in Kitimat, B.C., where emotional aboriginal chiefs told panelists the pipeline threatens British Columbia’s pristine coast and their way of life. As the saying goes, oil and water don’t mix. You might imagine then, that the proposed Enbridge Northern Gateway pipeline might be relatively safe, given it runs mostly over land. However, as the proposed 1177km double pipeline snakes its way across Alberta and BC, it would need to cross over 1000 streams and rivers – an average of almost one stream or river crossing for every kilometer of pipe built. These rivers include the headwaters of two of BC’s largest rivers, the Fraser and the Skeena, raising the potential for contamination as far away as Prince Rupert or Vancouver where they reach the ocean. The route also threatens the watersheds feeding the Stuart River, the Morice River, the Copper River, the Kitimat River and the Salmon River. Should there be a leak from either of the two pipes, something that is nearly guaranteed in the life of these projects, tar sands oil or highly poisonous condensate would be swept kilometers downstream, with disastrous consequences for fish, their ecosystems and the livelihoods they support. The statistical likelihood of the Northern Gateway pipeline spilling into sensitive BC waterways is high. As the above examples illustrate, oil pipeline spills are shockingly common. Between 1999 and 2008 Enbridge has had 610 oil spills from its pipelines. Over the past 20 years, pipelines in the U.S. have spilled a volume of oil 37 times more than was spilled by leaking tankers and barges combined. Modern technology has done little to improve that track record. The Yinka Dene Alliance has rejected Enbridge’s offer of 10 per cent ownership of its proposed $5.5 billion Northern Gateway Pipeline. The Yinka Dene Alliance has been one of the most vocal opponents of the pipeline, over concerns that a pipeline spill would harm the environment, particularly salmon-bearing streams and rivers. Further, sixty-one first nations chiefs of the Fraser River Watershed signed a petition to uphold their ancestral laws, title, rights and responsibilities to reject this pipeline. As a significant portion of the pipeline route crosses through territory where land claims have not yet been settled, First nations’ support is considered critical to the project. 80 per cent of British Columbians from Ipsos Reid and Mustel polls also oppose the pipeline and want to ban supertankers on B.C.’s north coast. Next post: Is the world choosing geoengineering by default?